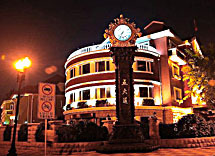 Foreign villas are assembled in Five Avenues, which includes five main avenues of Machangdao (mǎ chǎng dào 马场道), Munandao (mù nán dào 睦南道), Dalidao (dà lǐ dào 大理道), Chongqingdao (zhòng qìng dào 重庆道) and Chengdudao (chéng dōu dào 成都道). There are altogether 22 roads, with a total length of 17 kilometers and an area of 1.28 square kilometers. There are over 2,000 garden-style villas built in 1920s and 30s by different countries. It occupies 600,000 square meters of land and the total area is 1,000,000 square meters. 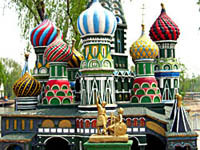 There are over 300 sites of scenery buildings and famous people. It is recognized globally as the Exposition of Neoteric Architectures. This church really stands out as architectural eye-candy. Constructed in 1917 by French Jesuit missionaries this Tianjin landmark features three massive green domes making it easy to spot miles away. The façade adds to the building's novel appearance with a series of orange and brown horizontal stripes. Given its visual prominence it boggles many minds over how this church survived Mao's cultural revolution. Today it is fully embraced as one of Tianjin's greatest buildings. Morning church services are held daily. 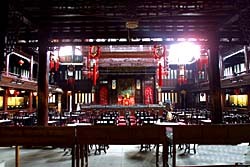 The Dabei Buddhist Monastery is made up of two parts: old monastery and new monastery. The old monastery refers to the three great halls in the west yard. The east yard features in the new monasterys. 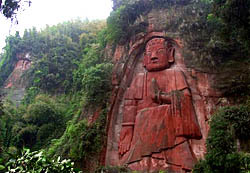 The statue of Sakyamuni in the east yard was created in Ming Dynasty (míng dài 明代). The whole Sakyamuni Statue is 7 meters high, 6 tons weight, with 9,999 small Buddha carved on the lotus throne. In the Cultural Relic Palace of the west yard, there many collections from every dynasties including hundreds of Buddha statues which are made of various materials from bronze, iron, stone to wood. 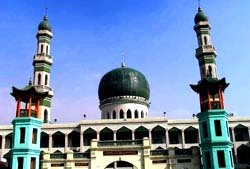 The Great Mosque lies in the northwest part of the city, Hongqiao District. As one of the most famous mosques in China, it has been an important Islamic shrine since the beginning of the Qing Dynasty (qīng dài 清代). The Prayer Hall is the most active and respected spot in the complex. In the mosque, there hangs over 60 couplets and tablets written in Arabic and Chinese characters. They are in a variety of styles and express deep meanings. Set in the second north gatehouse, precious brick art carving works mainly describe the famous scenic spots in Tianjin. Tianjing Opera Museum is housed in the building formerly known as the Guangdong Guildhall (guǎng dōng huì guǎn 广东会馆), which was built in 1907 and was frequented by Sun Yatsen (sūn zhōng shān 孙中山) and other Guangdong revolutionaries. 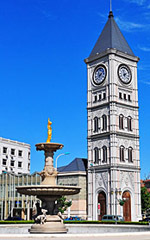 The former guildhall has an elaborate and luxurious central hall where opera is performed during March and April. The traditional Guangdong style courtyard now houses displays and exhibitions relating to the history of operatic performances and performers in Tianjin. Zhou Enlai, an outstanding founder of the Chinese Communist Party, studied in Tianjin in his youth time. He studied at Nankai University in Tianjin and later in Paris, where he took part in the Chinese Socialist Youth League. Zhou Enlai was the first premier of People's Republic of China. He held the post for 26 years till his death on January 8, 1976. He is respected as a hero of the Chinese revolution. His wife, Deng Yingchao is also revered for her devotion to women's liberation. 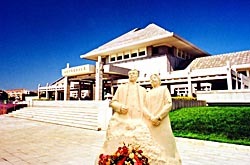 The museum shows the history of their lives and lifelong partnership. 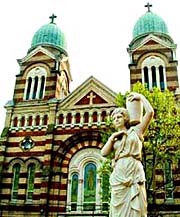 The Italian style Street is located by Ziyou Avenue (zì yóu dào 自由道) and Minzu Street (mín zú lù 民族路). Currently there are already seven merchants that have set up shop in the street, running and managing places like a foreign-style bar, an ice-cream shop, a Western restaurant, a cake shop and a café. 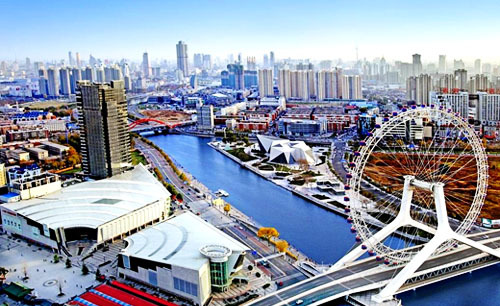 In addition, there are now trackless trolley cars for sightseeing, where tourists can see Tianjin's exhibition center, the old residence of Caoyu (cáo yú 曹禺), the Italian barracks, Marco Polo Square (mǎ kě bō luó guǎng chǎng 马可波罗广场) and other signs of Italian style and architecture. It is famous for fresh air and a strong country atmosphere. The design of the entire park, based on the natural plates of the earth, shrunk 115 attractions from 80 countries inside a park. All of the attractions are distributed reasonably and are well organized. Within one day, you can see many reproductions of famous sites from different countries. In Baocheng Alpine Garden, you can see a giant stone that is 10.7 meters high and 73 tons. It is said to be the largest one in Asia. It looks like Kwan-yin, dressed in a cassock and facing west. She seems to be thinking and appears to have achieved a state of perfect spiritual enlightenment. Entering the garden from the foot of this giant stone, you will walk into what seems like an ancient ruined stone city. 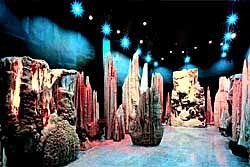 Following the loess path, you can see giant stones of various shapes standing in a great numbers. 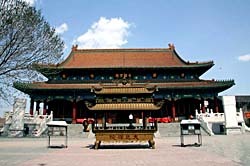 The courtyard is located in the Town of Yangliuqing (yáng liǔ qīng gǔ zhèn 杨柳青古镇). The Shi family was one of the eight most famous and powerful families in Tianjin in the late Qing Dynasty. The Shi family first became rich through trading grain and cotton, using the canal transportation that was popular at that time. During the reign of emperor Jia Qing (jiā qìng 嘉庆), the Shi family owned thousands of hectares of land and 500 houses. Now Part of the complex has been turned into the Yangliuqing Museum, which includes displays focused on symbolic aspects of the courtyards' construction, local folk art and customs, and traditional period furnishings and crafts. The Yangliuqing Prints Workshop produces distinctive Chinese wood block paintings featuring folk art style pictures of children, babies, fairy tales and operatic scenes. 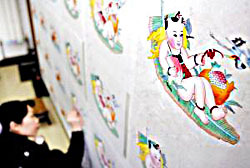 The town has specialized in this particular style of art since the 17th century and in China it is considered lucky to put these pictures on the door at Lunar New Year. The Yangliuqing New Year pictures are a popular souvenir from the Tianjin area. Huo Yuanjia was a symbol of Chinese nationalism at the turn of the 19th century, due to victories in fights against foreign wrestlers and boxers. Huo Yuanjia is featured in the Bruce Lee film 'Fists of Fury'. 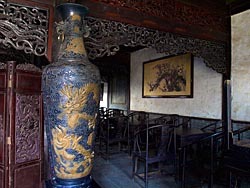 The former residence of Huo Yuanjia has a total area of 139.2 square meters. Inside you can see a series of artifacts used by Huo Yuanjia when he was working as a farmer, his weapons, daily things, furniture and 'the four treasures of the study'(writing brush, ink stick, ink slab and paper). The Comprehensive Service Hall contains dining rooms, entertaining services, areas to sell goods, and information services. Beyond Comprehensive Service Hall is the Up-class Flowers Hall, where you can enjoy numerous wonderful flowers. Follow the coconut tree corridor next to the music fountain to get to the Science Education Hall. The last hall, Tropical Rain Forest Hall, is the most wonderful. With its modern technology, Tianjin Tropical Plants Sightseeing Garden simulates a tropical living environment. 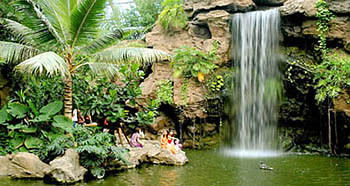 Rainfalls, thundering, and other replications of tropical climate happen here, placing the visitor in a real tropical jungle. It also holds seasonal theme activities. Mt. Baxianshan National Nature Reserve is famous for its continuous ridges and peaks, boundless forest, deep gullies and running ghyll. Its variety of animals and plants give the Reserve the reputation as the Green Kingdom. Thirty-five kilometers to the northeast of the county seat and covering 5,360 hectares, the forest reserve is also the gathering place for high mountains and peaks, with 19 peaks rising over 900 meters above sea level. The highest peak, also known as Cricket Cage, is the highest in Tianjin at 1046.8 meters. The Mt. 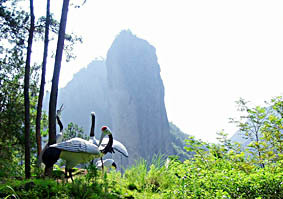 Jiulongshan National Forest Park occupies 2,126 hectares of land and three scenic areas: Nine Dragon Mountain (jiǔ lóng shān 九龙山), Limu Tai Mountain (lí mù tái shān 梨木台山), and Huanghua Mountain (huáng huā shān 黄花山). There are 147 peaks inside the park, and the highest, Lihua Tai Mountain, reaches 997 meters. Above the highest peak of Mt. Nine Dragon, Huanghua Ling (huáng huā lǐng 黄花岭), which is 558.4 meters, you can enjoy a wonderful view of Panshan Mountain (pán shān 盘山) to the west, the Royal Mausoleum of the Qing Dynasty (qīng dài huáng líng 清代皇陵) to the east, Cuiping Lake (cuì píng hú 翠屏湖) to the south, and Jiuding Mountain (jiǔ shān dǐng 九山顶), Ancient Great Wall and Mt. Baxianshan to the north, all contributing to the glory and gracefulness of the scenery.